PCR « Global Market Insights, Inc. Persistently being channelized by technological proliferation, molecular diagnostics market has, of late, been gaining rewarding proceeds from a plethora of healthcare applications including the likes of blood screening, oncology testing, genetic testing, and infectious diseases testing domains. Recent advancements in molecular diagnostic approach have brought a paradigm shift in the overall business perspective from basic research activities to clinical reality, which undoubtedly, has widened the application scope of molecular diagnostics industry. Modern day high-resolution molecular cytogenic analysis can detect duplications or deletions of DNA in thousands of nucleotides at once, ensuring high accuracy and easy operative approach. In fact, health giants claim the diagnostic molecular pathology to emerge from a niche domain to a viable alternative against conventional medical approaches that have been reigning the industry so far. As per Global Market Insights, Inc., overall molecular diagnostics industry size is slated to exceed a revenue of USD 12.5 billion by 2024. The sheer popularity of molecular diagnostics industry can be primarily attributed to the increasing occurrence of infectious diseases along with spreading public cognizance with regards to the pre-disease detection. According to some of the trusted reports, almost 80,000 new cases of HIV infections were found in India, in the year 2016. 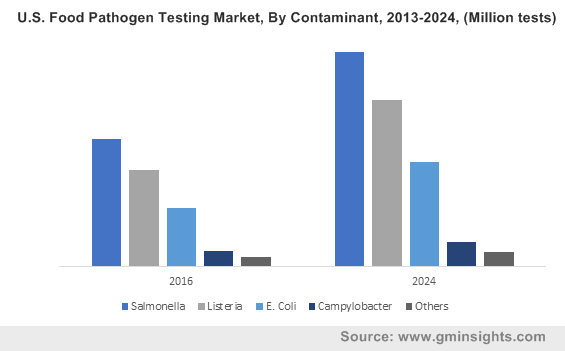 Furthermore, sudden outbreak of emerging infectious diseases like Ebola, influenza A (H7N9), MERS, has complimented molecular diagnostics market growth in terms of revenue streams and profitability. Another crucial aspect that has indirectly made the stage lucrative for molecular diagnostics market is the growing challenge of meeting optimal patient care, amidst the backdrop of resource-limited settings. Conventional diagnostic approaches are too expensive to be effectuated in RLS, given the economic constraints. In the face of this crisis, clinicians and healthcare giants have been readily inclining toward cost-effective molecular diagnostics that rely less on operator training. In this regard, Myriad Genetics, the American molecular diagnostics industry giant has been on the roll since for a while now, with its consistent effort of expanding the business portfolio. With a lineage of nearly 12 exclusive molecular diagnostics products, the company is making profound inroads in advanced gene sequencing cancer therapy. As per the recent reports, the healthcare biggie is presently thriving on the cusp of two of its patent molecular diagnostic suites, EndoPredict tests, and GeneSight. Some of the other companies witnessing a strong presence in global molecular diagnostics market include Abbott, Dickinson and Company, Alere, Becton, Biomerieux, Danaher Corporation, Bio-Rad Laboratories, GenMark Diagnostics, Johnson & Johnson, HTG Molecular Diagnostics, MDxHealth, and Novartis (Grifols). Amidst the intense share battle, experts claim product innovation to be one of the major growth rationales underlining the sustainability quotient for the market players. The current framework of an unclear regulatory landscape is deemed to be one of the major constraints somewhat hindering the molecular diagnostics market penetration across some of the geographies. Nonetheless, ongoing R&D investments to bring advanced molecular diagnostics techniques in the foreground in tandem with public as well as private organizations’ encouraging initiatives toward promoting molecular diagnosis are expected to act in favor of the industry proliferation in the coming years. 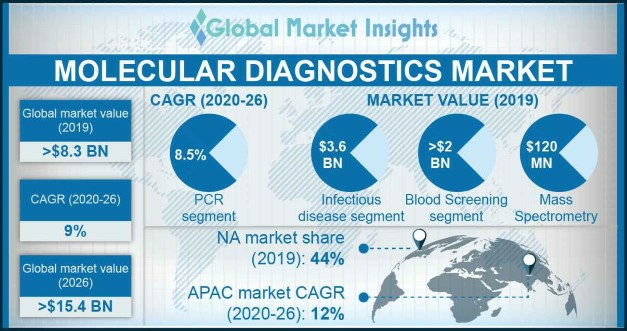 A report put forward by Global Market Insights claims the overall molecular diagnostics industry size to register a modest CAGR of 8.5% over 2018-2024. This entry was posted in Healthcare & Medical Devices and tagged Cancer Molecular Diagnostics Market, Chlamydia, Dengue, DNA Purification, Europe Molecular Diagnostics Market, Flu, Global Molecular Diagnostics Market, Gonorrhea, H. Pylori, Hepatitis B, Hepatitis C, HIV, HPV, Infectious Disease, Meningitis, Molecular Diagnostics Market, Molecular Diagnostics Market Growth, Molecular Diagnostics Market Outlook, Molecular Diagnostics Market Size, Molecular Diagnostics Market Trends, Molecular Testing Market, Oncology Molecular Diagnostics Market, PCR, Real-Time PCR, RNA Purification, RSV Virus, STD, TORCH, Tuberculosis, U.S. Molecular Diagnostics Market.